If there are words which fill us with horror, "Cholera" is one of them. Not without reason, as seven pandemics have traversed the planet since 1817, the year in which the disease becomes a defined entity. Confined for a long time to the Indian subcontinent, it goes beyond these bounds as soon as the means of propagation increase with the density of populations and the rapidity of movement. The highly contagious disease is due to a microbe, the cholera vibrio, discovered by R. Koch. The Colonial Health Service comes across this disease very early in Indochina as well as in Africa. It is always fatal. The Health Service has much to accomplish in place, remaining close to individuals and populations. The naval and then the colonial physicians must be credited, as the decades go by, with having interpreted the clinical presentation and fought against these terrible epidemics in conditions that were always difficult. Treatment, which has made immense progress since the advent of medical reanimation, sulphonamides and antibiotics, must be resorted to immediately in order to assure a favourable evolution and to minimize the dangers of dissemination. As soon as the diagnosis is established, and being aware of the modes of propagation of Cholera, the combat is undertaken as a matter of urgency and preventive measures put into place. Always apt to return to centre stage, Cholera, which spreads easily, provoking a high death rate, remains a disease that is still present and always accompanies the great calamities that afflict mankind. A cholera epidemic starts off from India in 1883 and, by seaways, reaches Egypt where there are several researchers, at this time of "microbe hunting". Koch is the first to identify the cause of the disease, a very mobile bacterium, whence its name of vibrio. Cholera is well-known to the colonial physicians and chemists on duty in Indochina and India. In 1890, they give a very precise description of the disease, insisting on its brutal manifestation, the seriousness of the symptoms, the rapidity of its evolution. In 1904, Guichoud* becomes a victim in Annam. Unfavourable conditions such as overcrowding, the lack of hygiene and the unsanitary state of individuals are already noted in 1862 and again in 1882. The abundance of bacteria of the genus vibrio in the excrements of patients, in fresh and salty water, in fruits and vegetables that are consumed raw is demonstrated in the laboratory. In 1937, in the course of an epidemic transmitted from China and well-studied by Bouchard*, Genevray* invents a method for isolating the vibrio, which considerably simplifies diagnosis. - The vibrio can be present and abundant in the faeces of individuals who show no signs of Cholera. These "healthy carriers" are also observed in the case of other diseases and play an important role in the propagation of the epidemic, for they spread the vibrio in the surroundings for months. Moreover, their number, when better known, reveals itself to be considerable, going up to 30% of the patient's family and those in contact with him or her. - Genevray*, at the 10th congress of the Association of Tropical Medicine of the Far East, points out the variability of the microbe. One of these variants, identified in 1905 and called Vibrio El Tor, is considered for more than half a century as being not very pathogenic. However, it is the single cause of the seventh pandemic which still continues. - The vibrio is destroyed in the stomach by gastric acidity, but it is through this gastric acid that the microbe penetrates the organism. There must be massive ingestions of the vibrio to get through the acid barrier. 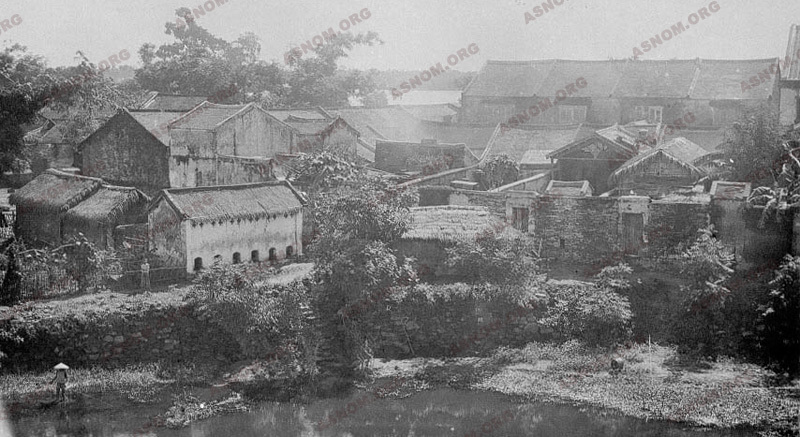 During the military operations for the conquest of Cochin-China in 1862 and Tonkin in 1885, Cholera and Diarrhoeas of the same type are, together with Malaria, the worst enemies of the troops. In its typical form, Cholera provokes nausea, abundant vomiting, and especially profuse diarrhoea with a sickly smell - 4 or 5 litres a day. The resulting dehydration brings on thirst, hiccoughs, cramps and cold sweat. At the same time, the skin temperature goes down towards 35°, the organism begins to collapse. Within a few hours or two days at most, the patient dies ! About 1925 R. Pons* writes : "Only after seeing the wards of cholera patients, after having breathed the smells that come from them, felt the coldness of the skins of the patients, heard their voices and observed their anguish can we have a precise conception of this terrible disease". In 1946, during an epidemic, F. Blanc* notes: "The mortality rate, weak at the beginning, grows rapidly to reach its maximum in two or three weeks. It then drops down to become practically zero at the end of the epidemic". The mortality rate is variable. It depends on the seriousness of the epidemic, the resistance of the subject and administering the treatment at an early stage. It also depends on the climate: in Africa, 35 % of the cases of typical cholera occur in the Sahel zone, 20 % in humid zones. The ideal treatment is easy to imagine. Cholera is acute dehydration starting from the intestines. Therefore the patient must be re-hydrated, rapidly and appropriately, either with perfusions (in cases of much vomiting) or orally. Using this treatment is not at all difficult in well-equipped hospital centres. The mortality rate is then minimal. "Curing one patient is easy, curing twenty together is difficult, a hundred impossible", said Félix. But that is what happens when the epidemic rages with hundreds of cases everyday, in zones without medical facilities where improvised structures are soon unable to cope. In such conditions, the mortality rate can rise from 10 to 90%. As soon as the diagnosis is made, the patient must be isolated, his excrements and their containers disinfected. ). All the liquids used in rehydration are useful, provided they are administered quickly and even very quickly: 7 litres in 15 minutes, followed by 10% of the body weight in 3 to 5 hours. At the same time, the intestinal milieu has to be treated. Until the advent of sulphonamides in the 1930s, such more or less inefficacious medications as carbon and lactic acid were resorted to. Today, antibiotics and certain sulphonamides, with even a single injection, sterilise the excrements in one or two days. They must be administered as soon as possible not only to the patients but also to those in contact with them in order to slow down or halt the progress of the epidemic. 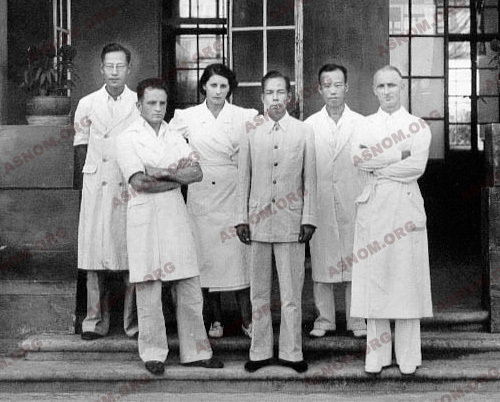 In 1890, with the arrival of the physicians of the Colonial Health Service, the network of medical supervision in Indochina spreads out and is strengthened. Epidemics are more carefully studied. They follow one another, each surge lasting from two to three years, making their way over land and sea and separated from each other by brief phases of inactivity. "Cholera only manifests itself as great outbursts coming from abroad, capable of ravaging cities and the countryside, but never maintaining its endemic force", says Heckenroth*. 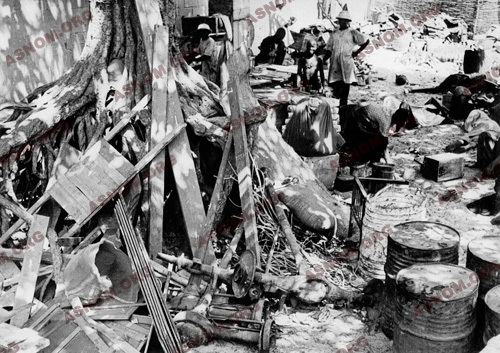 However, the epidemic in Indochina in 1926, in the course of which Laos is not affected, leaves 50 000 victims in 18 months. Six worldwide epidemics succeed one another in the 19th century, the last being from 1892 to 1896. Their extension is variable, sometimes just confined to Asia, sometimes spreading out as far as North Africa and even France where the epidemic of 1830 causes 100 000 victims. The destructive force of the epidemic is strengthened in places where large numbers of people assemble, such as centres of pilgrimage. Mecca plays a central role in its dissemination. The propagation of these epidemics is closely related to the faecal peril and the pollution of drinking water. The epidemic begins in the dry season when wells run dry and drinking water is drawn from ponds. It reaches its highest peak at the end of this dry season. Then the first rainfalls wash the soil, evacuate surface water, and the epidemic ceases. Black Africa is affected by the fourth and fifth pandemics in 1868 and 1893. In the course of the latter, Thiroux* isolates in Senegal the vibrio that he asks the Pasteur Institute of Paris to identify. It is declared to be "different from the typical species of Asian cholera". This "vibrion de Thiroux", as Le Dantec* calls it, is one more variant which illustrates the polymorphism of the microbe. The epidemic which swoops down on Marseille in 1884-86 marks a milestone in the early History of the Pharo. Strasbourg being in the hands of the Germans since August 1870, the French government decides to build a new military school of medicine in 1883. Marseille is a candidate and the school will be established in the Pharo Park. The funds are granted. Then arrives the cholera hecatomb. In order to organize rapid assistance and clean up the city's drains, the municipality is obliged to use the funds intended for the school. The choice of Marseille for the school comes into question and the establishment will be built in Lyon. Later, when it is a matter of creating a school of application for the health service of colonial troops, Marseille no longer faces an obstacle. The buildings are inaugurated on the 29th September 1907. In 1961, a seventh pandemic starts. It originates in the Indonesian archipelago of the Celebes round 1960. It is due to the El Tor vibrio. It spreads over Mediterranean Africa and then Black Africa through Guinea in 1970 (Lapeyssonie*). It invades the continent by way of rivers and lagoons. But French colonization has ended. It is the time of Independence for the African states. The seventh pandemic affords colonial physicians in the service of cooperation, just before the dissolution of their Health Service, the opportunity of administrating treatments and vaccinations (Dodin*), in very difficult technical conditions, and of studying the nature of the mode of contamination in the Sahelian and even the sub-desert zones. They observe two modes by which the epidemic phenomenon manifests itself. In the humid zones, adjacent to coasts and rivers, they find the Indochinese mode, that is to say, the growth of epidemics during several months, reaching their climax in two or three weeks and affecting a small section of the population (1 %). The force of the epidemics decreases slowly, leaving a weak endemic state or even the complete disappearance of the disease. On the other hand, in the Sahelian zones, as Sirol* observes in Chad, the epidemic advances in bursts, with brutal beginnings, affecting 50% or more of the population and then decreases rapidly. This demonstrates the importance of sweat, which is rich in vibrio bacteria, in the case of person-to-person contamination. - The protection of individuals by vaccination. But, before that, the first thing to do is to isolate the patients in order to treat them and to begin the immediate disinfection of objects used by them. The International Health Convention of Paris (20th June 1926). The International Health Regulation promulgated by the World Health Organization. - the control of latrines, etc. These measures are easier to put into practice in towns than in rural zones. In fact, everywhere, the essential measure to be adopted to counter the faecal peril is a good supply of drinking water and a sewerage system. 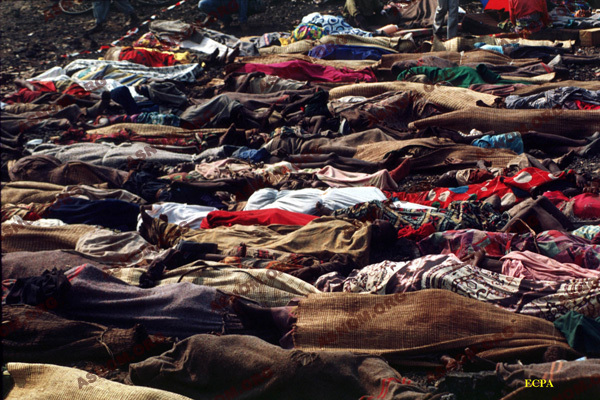 That is what led to the disappearance of cholera in developed countries. The fact is, at the present time, the WHO estimates that 78 % of the people in developing nations do not have access to drinking water and that 85 % are not provided with proper sanitary installations. They are almost always "healthy carriers" of the disease and must be treated with a single dose of long-acting sulphonamide or with an antibiotic that is active against the germ. In the case of an epidemic, the whole population is vaccinated as well as travellers admitted into the infected zone. The first vaccine against cholera, injected subcutaneously, is invented in 1884 by Ferran. Modified later by many others, its efficacy is inconstant (one out of two) and does not last long (a few months). 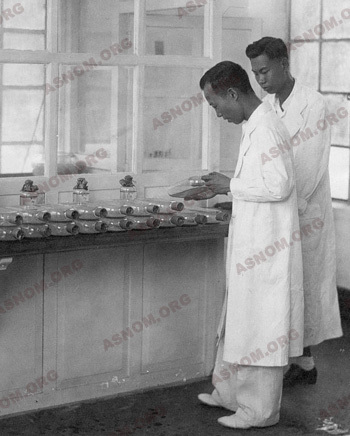 From 1927, Noël Bernard* in Indochina has 50 million doses of vaccine prepared and administered, which neutralizes all the existing breeding grounds of the disease. But there is a new wave of the disease in 1937-38. As nothing better is to be found, this vaccine is used during the rest of the colonial period. Its fabrication only ends in 1948. Research continues. In 1973, Dodin* proposes a drinkable vaccine. Tried out in Zaire, its effects are not convincing. Other vaccines are being studied. At the present time, the ill-effects of the seventh pandemic have ceased in developed countries but it is not over. Here and there, especially in Asia and Africa, thousands of cases are reported every year.